If you aren’t stopping in from the blog party, just a word of explanation — every year the great ladies over at 5 minutes for Mom host a party just for bloggers and their groupies. We all get to stand up and tell a little about ourselves and invite everyone into our corner of the world for a little look-see. So, if you already know, and hopefully love, this site, you won’t find much new in this post, but that doesn’t mean you can’t keep reading if you want to . . . However, if you are stopping by from the Ultimate Blog Party, I want to extend a warm welcome to my little home on the web made especially for all those Chicagoland area homeschoolers. We are still working on thawing out, still scraping windows on our cars, still yearning for that first spring flower. But, we are also still doing school and loving it. The Chicago area is packed with ideas and opportunities for homeschoolers. I have poured hours of free time over the last couple years into helping these events get a little more notice and become a little more findable to area homeschoolers. I do occasionally blog about my life as a homeschooler, various fun stuff I find on the web for homeschoolers, tips I have learned in the 9 years since we started kindergarten with our oldest, and practical balancing act advice. About half of the posts that I write are geared toward Chicago area residents since that is where I call home. Little snippets about me in no particular order — Homeschooler, Christ follower, happily married, mom x6, page turner, nose wiper, baby snuggler, support group leader, and forever a learner. Hope you can stay a while and find something worth your time. I’ve got reviews, favorite websites, and lots of tips on what to see and do in the Chicago area, especially from the educational angle. How many languages can we learn at once? We are in the midst of testing the answer to that question. We of course speak English. 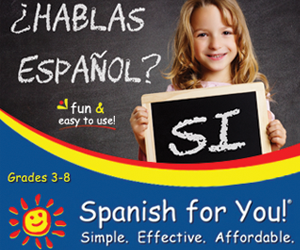 We have spent time in recent weeks learning Spanish and Mandarin, and also Latin. So, I guess it is reasonable when I say, “Salve!” that my daughter responds, “Hola!” But, then she grins and says, “Salve, Magistra!” I guess we can learn four languages simultaneously. I have a love for language for some reason. Whenever I traveled as a child I made a point of learning as much of the language around me as I could. So, I can say words and phrases in about 10 different languages. I can’t get enough of language, and I see the benefit as so many languages overlap here and there. The more we know of others, the more we understand our own as well. No language is that more true of than Latin. As we delve into Latin words we see hints and clues to the language that even our 10 month old is learning to speak, English. Latin used to be common place in schools in America. My parents both took Latin. Now, it has seen a resurgence with the classical school movement. Classical Academic Press has taken Latin and created an amazing curriculum that starts off with early elementary students and continues from there. I always knew Latin was beneficial to bring into my schedule, but never before found such a fun and easy format to do so. Song School Latin starts for the young learner, geared to kindergarten through 3rd grade. I used it with my five and seven year olds and they both picked it up easily and had incredible fun with it all. Begging to do foreign language? Seriously? Seriously. Details: Student book is a 130 page book with 31 chapters each containing 3-6 pages of activities and lessons. The teacher’s book contains the same pages with answers to all of the activities and a whole host of other activities in the back to supplement your Latin teaching time. These can be used for kids that need extra help, for general reinforcement, or just for some plain old fun. Fun from page one. As soon as the package arrived, my kids were drawn to the book and its contents. Great graphics, professional appearance, and appealing to kids. Reinforce, reinforce, reinforce. They see it in print, they hear it in song, they repeat it out loud, they answer questions about it, they connect it to their English knowledge, and they learn effortlessly. This program brings the same words before them time and again, but not in a boring redundant way. The kids enjoyed putting their knowledge to music and then repeating the new found phrases as we conversed. Reasonable writing expectation. Kids do a lot of writing some days in all the different subjects that they cover. So, when it comes to foreign language I prefer to focus on the verbal and save their hands. This material does have them do some writing, but it is mostly in the form of tracing letters already on the page. Just another way to help cement these new words in their memory. Ties in to English. There would be little reason to learn a “dead” language if we did not tie it into our lives. Each chapter includes a section that ties at least one of the vocabulary words into an English word that they already may have heard. This helps build and solidify their English vocabulary even during Latin lessons. Includes pronunciation guide. For you non-Latin speakers out there, you don’t need to be intimidated. There is a guide to the different pronunciations and you can easily pick this up with no prior Latin knowledge and teach and learn right along with your kids. You will probably want a workbook for each child. These are consumable books, so they will most likely each want their own. Just sticking to oral work would lose some of the benefits of the programs design. Could use more built in review. They do offer lots of great review tools, each chapter reviews a few earlier words, and there are a few chapters that are strictly review of all previous material. However, I have found that my kids can never get enough review. We definitely re-sing the songs often and each week would review all of the previous vocabulary so nothing is lost as we continue to add on. Any new language needs continual review and exposure to help it sink solidly into long term memory. Song School Latin brought a wonderful introduction to Latin for my younger kids. I wish I had this years ago for my older kids, but I will definitely be considering their other curriculums for them as well. They put together a great lesson plan and keep the kids from getting bored with a subject that has significant impact on other areas of learning as well. Disclaimer: This product was provided to me free of charge through Classic Academic Press as part of my participation in The Old Schoolhouse Homeschool Crew. I received no additional compensation and the opinions expressed here come from my personal experiences and sincere thoughts. Here is info on an upcoming informational meeting for those interested in dual enrollment at Judson. This is available to high school juniors and seniors. April 11th from 7:00 to 8:30pm at Judson University. Center. Go to www.judsonu.edu for a campus map. Mandarin Chinese video lessons to schools and homeschoolers. Definitely take some time to check out these videos. You could easily get a start at learning Mandarin with these videos. The teacher in the videos has a very conversational teaching style that I think your kids will enjoy. There are already 30 lessons up on the site. Not super high-tech, but the videos are clear, engaging, and educational. I had to laugh when I first saw the videos, but keep watching! They are packed with great information and will have you speaking the most common language in the world before you know it. This week only! Special Spring Break Hours! Still thinking of things to do over Spring Break? Don't forget we have a TON of activities available over Spring Break! our Two Day Science Camps: Hours are 9 am- 3pm. Before and after care is available. Brochures are available on our website: www.scitechmuseum.org. Kitchen Chemistry, Pirate's Treasure and (almost full) Totally Ballistic. Only Totally Ballistic has openings available. there is still time to open another two day camp starting on the 31st. Choose from Kitchen Chemistry or Pirate's Treasure. We would need to know by Monday 3/28 if you wish to open a camp. email: customercare@scitechmuseum.org or call 630-859-3434 ext. 218. Its time for kids to show off their Scientific Stuff and participate in the Great Egg Drop Contest at SciTech Museum. compete in a contest to see which egg survives the drop from our Mezzanine! /b>Regular admission is all you need to participate in the Egg Drop. admission can get you a whole day of "Scientastic" Fun!! We look forward to seeing you over Spring Break! As my kids get older it is easy to focus on their core texts and let other, but still important, subjects slip a little. Just when I was grappling with how to keep on top of those little areas, Big IQ Kids came to my rescue. This online program allows kids to learn independently in four essential areas — spelling, vocabulary, US geography, and math. They can just go with the flow of the program or you can customize it to their needs or your current academic focus. I was so grateful to be able to set it up initially, and then let my 6th and 8th graders run with it. I required them to do a lesson in spelling, vocab, and geography each day and it freed me up to work with my other kids knowing that these areas were covered. My kids have really enjoyed using this and it takes little oversight on my part. They get excited about advancing and it has really helped my daughter’s spelling in particular. It was a great review of state information as well and has overall been a great fit to teach and review in the four areas covered on their site. Details: An online program geared to kids K-8, and even adults. 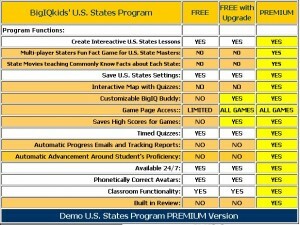 The program offers quizzing and lesson helps in spelling, vocabulary, math, and US Geography. Price: Pricing has a lot of different options, see their pricing page for all the details, but basically, you can get the whole program for $19.99 per month, $99.99 a year. You can also purchase just portions of it for a month or year if you want to target learning in a certain area. Their full program for a full year is really the best price available. Lots of free quizzing. Big IQ Kids offers some great stuff on their site that everyone can enjoy. You can have your child spend time quizzing on spelling, geography, math, and vocabulary. However, you cannot save their work or check their progress without setting up a membership that costs money. I think that’s fair. You can play around for free, but if you really want to track the progress and see the program become more customized to the user, you need to put in some money. To see if the premium options would be a good fit for you, you can enjoy a free 7 day full access trial. Game rewards. My kids always love the games. In Big IQ Kids they earn coins for each lesson that they complete. The coins can then be spent in the “arcade.” There are a variety of games, some better than others, but both my kids that used the program found something they enjoyed and would willingly work toward the reward at the end of the lesson. Email updates. Every time they take a quiz, pass a level, or do noteworthy work, I would get an email. It told me the percentage score and in many cases gave me specifics about what they missed. This was great to remind me to check in with them, to follow up on areas of struggle, and to praise them for the great job they were doing in the program. Focuses on success. While the email updates did include their percentage and what they got wrong, it also encourages you to praise your child. My kids did not get discouraged by low scores, because they could repeatedly redo quizzes until they achieved the 100%. This was great. They weren’t stuck somewhere with a poor score, but continued to work hard to get to the next level or master the new content. The site does contain ads. It may just be in the free portions of the site, but there are ads geared toward kids on the site in various places. Most of the ones that I saw were for games or vacation locations. I didn’t see any offensive ads, but there were ads. The voice on the site is very computerized. At times we did have difficulty understanding some of their words, but most of it you could also read along, so it was not a problem to fill in the blanks left by the occasionally unintelligible host. In general this did not cause a problem, but it is something to be aware of. More drill than instruction. My son commented that no matter how many times they asked him the vocab word he wasn’t going to get it right, because they didn’t give him any help in remembering the definition. They do tell the kids to write the words they get wrong and they do let them know their mistakes, but they try to teach it through repeated drills, not really teaching for understanding. This will be fine for some kids, but my son always needs to know the “why” so he struggled with this method of “teaching.” I was impressed that my kids were good about writing the words three times when the program told them to. However, it is really on the honors’ system that they follow through with this. Might want to check the accuracy of state info. We live in Illinois, obviously, and so we know a bit about this state we live in. And, in the little blurb about our state in the geography section there was some less than accurate information. Just outdated stuff about O’hare and the building formerly known as the Sears Tower. Facts do change over time, and with how much information they carry I’m sure it is difficult to make sure it is all up to date. Well, I emailed them and within the next business day they had changed the information to reflect current data. They also recognized the need to verify the other state’s information. I definitely appreciated their speedy response and their desire to make sure their product is top quality. We were quite pleased with Big IQ Kids in our home. It was a great fit for our current needs and I love the flexibility of pricing since you can just pay for what you want if you don’t want the complete package. It encouraged learning and really brought about improvement in the areas that it covered. Love finding products like these that really fill a need. Disclaimer: This product was provided to me free of charge through Big IQ Kids as part of my participation in The Old Schoolhouse Homeschool Crew. I received no additional compensation and the opinions expressed here come from my personal experiences and sincere thoughts. Homeschoolers! Here’s YOUR chance to participate in a real, regional science fair! Tuesday, April 5, 2011, 7:00 p.m.
No cost. Freewill offering accepted. Tuesday, May 3, 7:00 p.m.
What could have caused snow to remain year-round for so long that it built up into glaciers up to 2 miles deep, on up to 30 per cent of earth’s surface? What happened to those millions of mammoths who are now found frozen in permafrost? No cost. Freewill offering accepted. You can see a full list of scheduled speakers on Midwest Creation Fellowship’s site. additional year is being heard in committee today in Springfield. Gordon’s HB 2985 would raise it to age 18.
person’s life subject to state mandate is not acceptable. http://www.hslda.org/toolbox to find out who your representative is. necessary for you to identify yourself as a homeschooler. More details and contact information on HSLDA’s website.